Poor financial management is among the top causes of 98% of small businesses closing within 10 years of opening a small business. One of the most important aspects if financial health as a small business owner is understanding your tax obligation. In fact, not knowing what taxes are due can take a hit on your profits. If you’re a small business veteran, you know that in addition to filing an annual tax return, you will likely make quarterly estimated tax payments. For new business owners, estimated tax is when the IRS requires freelancers and small business owners who surpass a specific income threshold to pay four installments throughout the year. Self-employed individuals, including sole proprietors, partners, and S-corporation members or shareholders typically have to make an estimated tax payment each quarter. This is the case if they expect to owe $1,000 or more when their tax return is filed. Corporations generally have to make estimated tax payments if they expect to owe tax of $500 or more when their return is filed. Generally, the payments are due on income received when income taxes have not been withheld. This includes self-employment income, interest, dividends, alimony, rent, capital gains, prizes, and awards. Not all small business owners or freelancers are subject to paying an estimated quarterly tax. 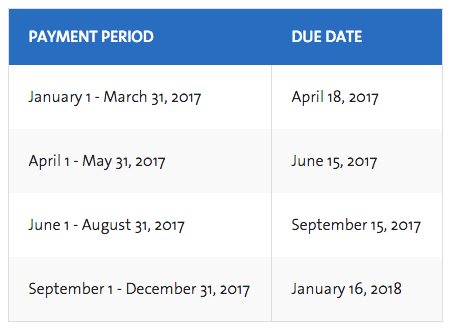 If you know you owe quarterly taxes this year, understand the payment schedule. While dates may change, quarterly estimated taxes are always due mid-month in April, June, Sept., and Jan. Still need help determining if you need to pay estimated taxes on a quarterly basis? Read the IRS’ Form 1040-ES, Estimated Tax for Individuals (PDF), or Form 1120-W, Estimated Tax for Corporations (PDF), for more details on who must pay estimated tax.